It is one of Earth's newest landforms and it could just tell us where to look for evidence of life on Mars. 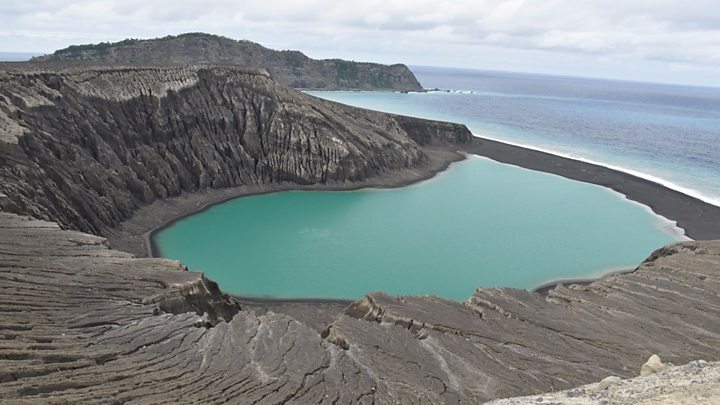 The tongue-twisting volcanic island of Hunga Tonga Hunga Ha'apai exploded out of the Pacific Ocean in 2015, and its shape has been evolving ever since as it has been lashed and bashed by waves. If that is true, it is really intriguing. On Earth, we know that wherever you get submarine volcanic processes, you also very often get conditions that support microbial communities. What the researchers see occurring at Hunga Tonga Hunga Ha'apai (HTHH) therefore may be a kind of template to help them understand better the water environment on early Mars and, by extension, whether the conditions might also have been favourable for the initiation of simple life. Media captionDr Jim Garvin: "We're watching the island do its dance"
"The thought was that we might be able to use recognition of these kinds of landforms to be an indication of palaeowater stories, depths and longevities on the Red Planet," said Dr Jim Garvin, chief scientist at the US space agency's (Nasa) Goddard Space Flight Center. "So, we're going to use HTHH on Earth to train us to understand Mars." Dr Garvin and colleagues have been reporting their studies of HTHH here at the Fall Meeting of the American Geophysical Union (AGU) - the world's largest annual gathering of Earth and planetary scientists. The island grew out of the Hunga volcano - a 1.3km-high mountain that is all but submerged in the southwest Pacific in amongst the Tonga archipelago. 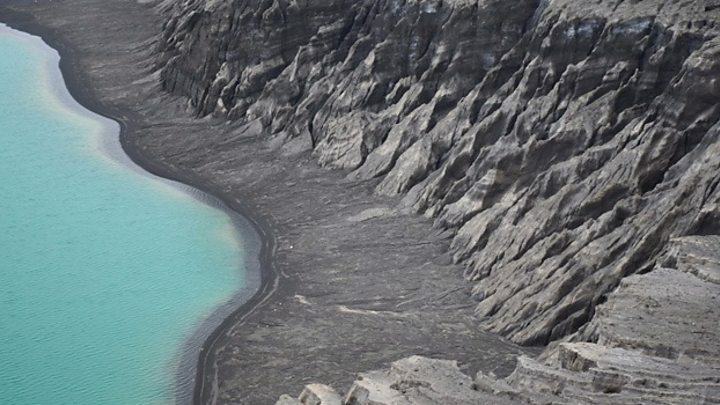 The new landform came into view in what is termed a "surtseyan" eruption, named after a very similar island called Surtsey in the North Atlantic, off Iceland, in 1963-7. In such events, hot magma coming into contact with cold seawater causes a violent blast of ash and rock fragments. This material then collects at the ocean surface, forming a tuff cone that in HTHH's case is more than 100m high. But scientists do not expect it to stick around forever. Storm action should eventually dismantle it. However, this could take several decades and scientists intend to use high-resolution satellite imagery to watch the process every step of the way. Indeed, this is the first such island in the modern space era to erupt like this and not immediately disappear, giving scientists an unprecedented view from orbit of HTHH's early life and evolution. "One of the things we're hoping to do with HTHH is connect the pace of erosion with water at different depths," Dr Garvin told BBC News. "We'll end up with time-lapse photography of this island going through its erosional cycle, and that will give us then a sequence to go look for on Mars. And if we see it there, then maybe that tells us that water on the planet in some of these places was tens to hundreds of metres deep, and present long enough certainly to do the same erosional work." Water and time are essential ingredients for life. So too are an energy source and a supply of nutrients. On Earth, all these conditions are found at volcanic vents on the ocean floor. Microbial communities build up around the mineral-rich waters that gush from cracks in hot rock. And this is one of the reasons why scientists are tasking satellites now to look for evidence of similar, past activity on the Red Planet. Mars is currently bone dry but it was not always that way, and if it had volcanic systems similar to HTHH or Surtsey then their remains could well be among the best places to send a rover to search for signs of preserved biology. Dr Garvin said: "Hydrothermal systems on Mars have long been realised as being a great spot both for possibly having had life or producing minerals and landforms that could preserve it. We talk about 'biosignature preservation potential' - it's one of the things the Mars 2020 rover that Nasa is flying will go look for." His colleague Dr Dan Slayback has been trying to work out how long exactly HTHH might be with us. The satellite imagery observed very rapid decay early on. "If that trend had continued we would have expected perhaps a six-year lifetime, but at about the six-month mark, the rate of change decreased," the Goddard scientist told the AGU meeting. "A simple linear fit to all of our data today gives us a 26-30-year lifetime."